I decided to split this because the thread is full of alot of discussion of the larger issues surrounding this claim. I want to focus, specifically, on the analysis he presents, and mine. Since I constantly harp on them for being imprecise, not citing their sources, not dealing with error-ranges, and not stating their assumptions, I've decided to repeat JDX's calculation, first, and then do it myself, properly. 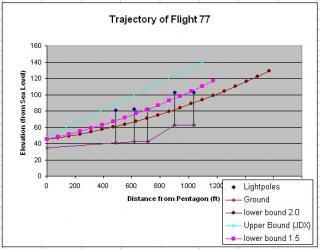 To calculate the height of Flight 77 as it passed over each of the 5 light poles, based on all available data. Since it has been established that absolute elevation according to the Flight Data Recorder's (FDR) altimeter is imprecise, we are going to construct a motion model and constrain it by the final impact point, the relative elevation changes from the altimeter, and the geometry/elevation of the terrain. From this, we are going to extrapolate the plausibility of hitting the light poles on the way to the pentagon. I used the USGS elevation site (the same site he sources, and all the same numbers he uses, for elevation). Note: There is an inconsistency in this data (his data). The FDR's last blip appears to be 900-1000 feet away from the pentagon, and it also appears to be traveling at about 800ft/s, maximum. If those two numbers are correct, the FDR should have had another blip. That means one of the two pieces of data I am using is wrong (and/or the errors in each are large). Distance errors - I didn't check google earth's precision, but barring a major error, these are relatively insiginificant. Eleveation errors - The site sources +- 7m, minimum. I DID NOT, however, account for this error. Good elevation numbers are (probably poorly) assumed. FDR Timing/Location - I didn't check the error of the locations/timing of the sample points in the FDR data source I used (the same one JDX used), I assumed it was accurate. Now, in order to compute a second order motion model, I will need to define several variables. Acceleration will be constant (and is defined by the slope of the prediction line). Initial downward velocity is chosen to be -66 ft/s, the amount of the previous second's average. Final position is taken to be at the pentagon impact point. The last parameters is how long this traversal time takes. How long does it take to go from the point where the plane is at -66 ft/s vertical velocity, until it hits the pentagon? This is a hard question is answer. 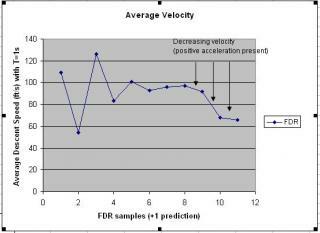 The Mean Value Theorem, applied to the FDR recorder data, says that at at least one point between 1s and 2s before impact, the plane was at -66 downward velocity. Since this is a lower bound, I chose to use 2s as the more extreme scenario (I also ran 1.5 for fairness). This equation should, at T=2.0 (or T=1.5 for the other one), should be hitting the pentagon. I have spare you the tedium of all the calculations. There are repeatable, and I have the excel file if anyone needs it. What have we shown? That a plane hit the pentagon? No. What we've shown is that all that would be required for a plane to hit the pentagon, and all the lightpoles, given all of JDX's data, is for the pilot to have given the plane a minor amount of acceleration. How much? Roughly the same amount he gave the plane between 2 and 3 seconds before the crash. I did not even take into account the lift that ground-effect probably already gives the plane. Last edited by Anti-sophist; 4th October 2006 at 04:20 PM. I think these JDX claims are beyond silly, but this is a very interesting analysis, A-S. In your list of potential error sources in JDX's calculations you omitted the main one: JDX's brain. Accounting for that error would take some doing. I thought it was odd that his descent wasn't parabolic. In fact, I think it'd be hard to graph at all. I'd imagine controlling a plane manually probably isn't going to match any equation plot, perhaps a series of plottable equations or a "best match" line, but I'd imagine the plane's descent and speed is going to fluctuate quite a bit from all of the other forces in play. Going into a project thinking the descent is going to be plotted linearly is setting yourself up for a disappointment. Good job though, it's good to see somebody can come up with a better description using the same data he is. It is a far more plausible explanation of what happened that some silly theory, of fly over. Just so I fully grasp what you said and get my head around it. The only way Johnny’s theory will hold up is if the plane maintained a constant speed and did not accelerate or decelerate in any way and if the angle of approach did not alter at all. I should imagine if this was the case, it would be impossible for any pilot, let alone a one just about to fly a plane into a building, to do so manually. I just cannot see any human being able to hold a machine at a constant and precise speed manually, under the given circumstances. The "pilot" was aiming at something. Anyone who has ever tried this, walking, on a bicycle, in a car--knows that the closer you get, the bigger your errors are, and the more correction required. I have been looking over JDX's work. It seems the vertical acceleration (G Force) is the most that has me puzzled since it doesnt show any leveling out during the last second. It actually shows an increase in the rate of descent. As for being linear descent rate, it was one second of time frame that shows almost 4000 fpm descent rate at 09:37:44. One would think you would have to pull some massive G's to pull out of that dive in less than a second from :44-:45 impact time. The FDR shows the opposite. Thank you, Anti-Sophist. To sharpen up your approach, however, could you go a little bit further into the acceleration values? What values of acceleration did you find for your "minimum" and "maximum" traces? Units of feet per second seem appropriate here. In the FDR recorder, there should be accelerometer data -- I haven't checked but I will. I believe these are sampled at 8 Hz but they can be averaged over a few seconds to get a reasonable approximation of the sensed acceleration. Did you look at this? If so, does the value agree with the acceleration you computed through the Quadratic Equation? All in all, though, you have clearly demonstrated that considering the approach as a straight line is not a safe or credible assumption. I had no idea that Mr. Doe X had made a straight line assumption when I responded to Skeptic4Sure in this post. I was never presented with his method, merely his results, and was hoping Skeptic4Sure would explain the method. It never occurred to me that he'd make such a foolish assumption. This is yet another reason why his results are not credible... I'll add that to the list. At this point, we can conclusively state that his approach, while not entirely wrong, is far too crude to make his case. The data from the FDR are still plausibly consistent with the official theory. My worst-case acceleration assumption is 24 ft/s^2. (about 3/4 of a G force). This is based on the average acceleration between -3 and -2 second from impact. Thanks. I'd consider that a very credible acceleration, easily within the performance limits of the aircraft and consistent with a moderate last-second correction. I don't see either of the effects you are talking about. The rate of descent is clearly decreasing during the final 3 seconds, that implies a positive acceleration, not a negative one. If there is acceleramoter or other data that is giving you that information, I'd like to see it. A 4000 fpm descent is about 66 ft/s. 66 ft/s to 0 ft/s, in 1 second, requires exactly 66 ft/s^2 of acceleration. That is 2 G-forces, which is standard G force for a normal commercial airline with professional pilots, let alone a hijacked one. Not exactly "massive" Gs. Something doesnt look right from JDX's Pilots forum. I have analyzed further Flight Data Recorder Parameters in terms of vertical speed vs. G Forces to see if there was any indication of this aircraft pulling level to cross the lawn (should the aircraft be low enough to hit the poles). One of the only parameters we have from :44-:45 is G Force. All other parameters stop recording at :44. Working from a normal airspeed below Vmo (where we know definitely there are no "errors") to the final second of recorder data we have a descent rate of 4637 fpm. This descent rate is not excessive to cause lag in the altimeter. The descent rate did get up to 6300 fpm at the :32 second of recorded data. This was the highest descent rate. The G Forces here were at .8 G's. While leveling to a 4900 fpm descent rate at :37 seconds, the aircraft pulled 1.6 G's at top vertical acceleration. So, in plain english, the aircraft needed 5 seconds and pulling 1.6 G's to slow the descent rate by 1400 fpm. This is a benchmark number. At the :39 second of recording, the aircraft was descending increasing rate to 5,760 fpm. Then the aircraft pulled 1.7 G's (top force) to slow the descent rate to 3960 fpm at the final second of data :44. So this aircraft took 5 seconds and 1.7 G's to slow descent rate by 1800 fpm. Pretty much in line with above analysis. The G's are recorded till supposed impact time of :45. We do not have altitude data for the :45 impact time. The G's were less than 1 G for that final second. Meaning, the aircraft was increasing its descent rate for that last second :44-:45 from 3960 fpm and higher. It should have been leveling and pulling out of the dive if it were just above the lawn. If the aircraft were higher, the data makes sense. 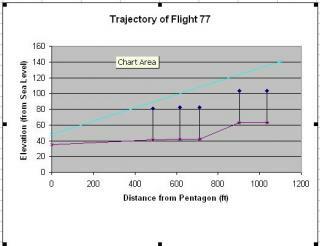 Conclusion: This is in direct conflict with the DoD Video and completely impossible to have this descent rate if the aircraft was low enough to hit the poles. If the aircraft was low enough to hit the poles.. it would have dug itself into the ground with this descent rate after the :44 second. The Vertical acceleration (G Forces) actiing on the aircraft would need more than 10 seconds at 1.7 G's to pull out of that dive. Or, it would need to pull more than 17 G's in 1 second to pull out. Impossible for the airframe. The wings would have ripped off. In order to be level across the lawn, the aircraft should have started its correction (pull out of dive) at the :35 mark or before based on the G Forces recorded. It did not. The FDR is consistent through all parameters i have checked thus far that AA77 did not hit the light poles. Altitude, Vertical Speed, System indications, G Forces, Alternate Analysis working back from the poles based on vertical speed alone... etc. Go here to download the csv file if you would like to cross check yourself. It appears the plane needed 1.7 G's to slow the vertical speed roughly 1800 fpm. 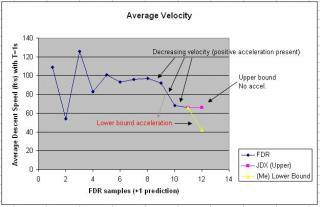 It looks like JDX used the actual numbers from the FDR to provide a benchmark for vertical acceleration forces and the result. I'm puzzled. By the way, I have also read that the reason JDX did this alternate analysis working backwards from the poles was to show something to a guy named Billzilla? I guess Billzilla did this analysis first? Do you have that analysis? It seems this analysis was a hypothetical based on Billzilla's claims. I'd like to see that. I'm still highly skeptical of JDX's claims of 480MSL. It appears he went to Boeing and a few other companies to get some answers, but was refused. I'm also trying to work some of my channels. Huh? A benchmark? It doesn't require 1.6 Gs to decrease 1400 fpm in 5 seconds. Basic high school physics tells us that 1G is non-accelerating, and so 1.6Gs is an upward acceleration of .6 g-forces. That' s about 1152 fpm, increase, per second. At 5 seconds, with 1.6 G, you'd get about 5000+ fpm increase, not 1400. This is basic physics. The _average_ G force during that period was only 1.14. How do I know? Because 1400 fpm change in descent speed, over 5 seconds, is about 260 fpm/s. The acceleration due to gravity is 1920 fpm/s. Again, wrong, for identical reasons. The Vertical acceleration (G Forces) actiing on the aircraft would need more than 10 seconds at 1.7 G's to pull out of that dive. Like I said before, if you are descending at 4000 fpm, you need to pull 2g positive acceleration (or about 3G), to correct -all- of that descent in a single second. Or, it would need to pull more than 17 G's in 1 second to pull out. I don't know who he is, nor have I ever heard his analysis. Regardless, JDX 's math is not good, and his analysis is crude. Even if it was meant to rebutt someone, the conclusions he draws are not warranted. Furthermore, the quality of my analysis is independant of the quality of Billzilla's. Last edited by Anti-sophist; 4th October 2006 at 08:54 PM. I looked over the csv file and it looks accurate. The aircraft was descending almost 6000 fpm at one point, then it pulled 1.7 G's and slowed the descent rate to about 4000 fpm. Put the altitude columns side by side with the vertical acceleration columns. It actually makes sense when looking at the trend. Find out descent rate in between each second for the last minute. You'll see the correlation in G force as the descent rate increases or decreases. Also remember that 1 G is the "zero" point since straight and level flight is always at 1 G. I'm not a math major (and I wouldn't remember all those forumula's anyway haha), but the csv file makes sense when you put it side by side with the columns described above. The only thing that doesn't make sense is the fact that the plane pulled 1.7 G's to slow the descent rate from 5760 fpm to 3960, and then showed less than 1 G thereafter. In other words, the csv file doesnt show any G force for pulling level across the lawn after the :44 second time stamp. It only shows 1.7 G's prior to slow the descent rate from 5760 to 3960 in the 42-44 time stamp. Very weird. Last edited by weedwacker; 4th October 2006 at 09:25 PM. I think I may have to disagree with you here. 4,000 fpm is nothing to sneeze at. In order to pull level in 1 second from that dive would take alot more than 3 G's in my humble opinion. Especially with all that mass and momentum heading towards the ground. Also to note, the csv file never gets above 1.7 G's and is less than 1 G for the final second. Last edited by weedwacker; 4th October 2006 at 09:46 PM. The aircraft was descending almost 6000 fpm at one point, then it pulled 1.7 G's and slowed the descent rate to about 4000 fpm. Yes, that may have been the maximum instantaneous G-Force, but the previous quote you showed me was treating it as an average G-Force, which would be wrong. That's only partially correct. 1 G flight is only straight, it's not necessarily level. The mass of the object has nothing to do with how much acceleration is needed to stop it. I think I may have to disagree with you here. 4,000 fpm is nothing to sneeze at. In order to pull level in 1 second from that dive would take alot more than 3 G's in my humble opinion. Especially with all that mass and momentum heading towards the ground. Well, your opinion isn't up against me, it's up against Isaac Newton. Mass and momentum have absolutely nothing to do with acceleration's relationship on velocity. G-force is an acceleration, and 4000fpm is a velocity. More mass means it requires more force, for the same amount of acceleration. As I said, 4,000 fpm is not vert fast. It's 66 feet per second. It's 45 mile per hour. If you drop a rock from the top of a building, neglecting air resitence, it will take it all of 2 seconds to reach that speed. Last edited by Anti-sophist; 4th October 2006 at 09:54 PM.
. More mass means it requires more force, for the same amount of acceleration. G Force is a Force. F = ma. Basically, by your claims, a 757 would take the same amount of G's to pull out of a 4,000 fpm dive in one second as a Learjet. I highly disagree. Besides the fact that the csv file never shows 3 g's for one full second, anywhere. But, I do admire your work and thanks for the input. What kind of student are you? Physics? I might also add, I dont even think its possible to arrest a 4000 fpm descent rate on a 255,000 lb object in one second without hitting a wall or something. Can you stop your car in one second from 45 mph (66ft/sec)? What would the G's be if you did? Last edited by weedwacker; 4th October 2006 at 10:10 PM. No, a g-force is not a force. It is an acceleration. It's a misnomer and often causes confusion. You _experience_ a force, when undergoing g-forcing acceleration, (given by the equation above), but 3Gs is 3Gs, no matter how much you weigh. You may disagree all you want, but it's factually true. A 757, a Learjet, a rock, and you, all require the same amount of G's to pull out of a 4,000 fpm dive. So? Who claimed that it did? Who said they ever pulled out of the dive? I've never claimed the plane corrected all of it's descent velocity and was perfectly level. Even still, your claim doesn't add up. Duration matters. 1 second at 3Gs is equal to 2 seconds at 2G is equal to 4 seconds at 1.5G is equal to 8 seconds at 1.25G (in a plane, that is, fighting against normal gravity). Last edited by Anti-sophist; 4th October 2006 at 10:18 PM. Again, your intuition is failing you. I've proven it to you time and time again (mathematically, using the laws of the physics) that a simple 3G pull-up, for 1 second, will do the trick. Why do you keep asking questions I've already given you the answer to. You would experience 2Gs (forward) for that entire second, if you were in a car that did 45mph -> 0 mph in 1 second. Did you claim earlier that you are a pilot??? Sorry if I have my wires crossed, but I thought you mentioned you were. the aircraft shows a 3960 fpm dive at time stamp :44. The G's after that show no correction. It actually shows less than 1 G. Where is the correction to start pulling out of the dive? The G's shown prior to the :44 second time stamp are pulling level from 5960fpm to slow the descent rate. 0.69<doesnt show any G's to level the 3980 fpm descent. Last edited by weedwacker; 4th October 2006 at 10:21 PM. the aircraft shows a 3960 fpm dive at time stamp :44. The G's after that show no correction. Why do you keep insisting that the plane hit the pentagon when it was level, and therefore HAD to correct for the 4000fpm descent? All I've said is it's not _impossible_, I didn't say it happened. And to answer this question, I graduated recently with my Master's Degree in Electrical Engineering. But I now also understand JDX's 480MSL based on local pressure correction. Wow. I really have to look into this further. Thanks for all the help everyone. I'll continue to post so observations. Yes, I'm a retired Airline pilot from Independence Air. Haven't thought much about flying since except for buzzing around in a 172. It good to get the ol' noggin working again. I'm going to try to contact this JDX guy and see if he worked for FLYI. The 5 frames video that shows it level just above the lawn. I firmly believe the 757 hit the pentagon. We have people from FLYI that say they saw it on the way in to work from DC. But this FDR is very interesting. Did this really come from the NTSB? Oh dear. How exactly can you tell the plane is level from 5 frames of video, when only one of those frames shows the plane? (and it shows it rather poorly). Certainly the 3 frames of explosions aren't helping. Can you provide any credentials to back this up? haha, on the internet? Sure, right after you provide your birth certificate. Do you think I'm a fake? As I said, I can take my posts back over to flightinfo. No sweat off my back. It already seems some of you people attack anyone that comes here and obviously this JDX guy has many of you so riled up. My best advice is to get some whiskey. Go out and see a movie. Enjoy your life. Don't let one person get so under your skin. Especially one that you don't know and one that you obviously disagree with. How many threads are here on this guy alone? You don't even know him? If I seem protective of him, it's because if he did work for FLYI, it was one big family and we all went through alot with that airline. But, that doesn't excuse his claims if they are wrong. Good luck all. Try not to let one person get to you. Here here. Let's all take a breather (well, not me, I just started posting in this thread, and I don't know NTSB from NSTB). WW said he was going to check out some numbers on JDX site; after he does, he can get back to us with what he discovered. In the meantime, we can discuss this and that, of whatnot and happenstance, of cabbages and kings, and where the sea is boiling hot. I think the issue of credentials is only relevant if someone cites their experience, rather than evidence we can check (argument to auto-authority? ), or if they get things wrong that someone with the claimed experience should get right. JDX has done both of those things at times, so asking him to show his credentials is to be expected. I don't see why Weedwacker should be asked to show credentials unless he makes questionable claims or doesn't seem to know what he's talking about. I've seen no evidence of that behavior. My concern was raised by the confusion over G Force, which is absolute grass-roots basic stuff for a pilot. You are correct, however, that Weedwacker did not cite his experience. That was my oversight. I apologise if anyone took offence or thought I was out of line. An accelerometer reading of zero G's probably doesn't mean that the aircraft is freefalling. The accelerometer doesn't know about Earth's gravity. If the aircraft is flat and level, experiencing no net acceleration, the accelerometer reads zero G's. If the accelerometer reads -1 G, it means the aircraft is diving at freefall. If it reads +1 G, it means the aircraft is climbing. You have to treat the aircraft itself as its own Newtonian reference frame for this to be consistent. If the aircraft doesn't accelerate at all, it means zero G's. That means flat and level flight. Also, for what it's worth, I've found weedwacker's comments to be completely reasonable. I could care less what his background is, it's the quality of his arguments that matter. That goes for every person here. Let's not make the mistake of the CT's, and let everyone have their say. Thanks. I didn’t know about JDX math stuff, it looks like that parking camera information is used in your analysis, some people claim that that frames are edited but even if that info is genuine you have to know something about the accuracy of the frames. The frames are crappy, crap in crap out. Even my dad has a better camera for his business bought at the local store for a few euros. Normally when you have n points you can estimate the “real” trajectory by a polynomial of order n-1, I think a 2nd order estimation is sufficient for an airplane, because the heavier they are the straighter the trajectory will be. But of course if there is a lot of force available the momentum (hence velocity) can change rapidly. I assume the acceleration of a plane is public and available information that can be found somewhere? Once you have the position of function of time the velocity as function of time is nothing more than the time-derivative and the acceleration is another time-derivative. Be careful because an initial error in position will strongly affect your end result. This is something I would be interested to know for sure. I would have thought that a stationary accelerometer at MSL would read +1g since it is, after all, experiencing an accelerative force (gravity). By this logic, zero G's would mean free-fall. An accelerometer does not "know" what the source of the acceleration is. It has no way of segregating gravitational acceleration from any other kind because this is simply not possible and is, in fact, one of the corner stones of relativity. The only way to construct an accelerometer which would read zero G's in the above scenario is to artificially compensate for the expected gravitational force. Perhaps the FDR data has been adjusted for this. I don't know. The lift generated by the wings is an accelerative force. And in level flight at MSL lift equals exactly 1g. Agreed. I jumped the gun. Badly. Correction there. The accelerometer will read +1 in normal, straight & level flight. If it reads zero, then you are actually in freefall. Notice how it is reading 1 in 'normal' condition, and that marking is thicker than the other lines? That's why the DFDR data will show '1' vertical acceleration a lot of the time. So the last DFDR data showed 3960 fpm rate of descent, and about 0.6G during the last recorded second. That's to be expected because the the aircraft was descending, thus lower G.
Still, DOH! himself has said that 4000 fpm is not "excessive" for an airliner, so he would have to admit that pulling out of that descent is quite possible - especially some 400 feet above the ground (very rough figure, and assuming DOH! is correct with his calculations) when you are not concerned with overstressing the aircraft. You know, what this does go to show is that you need to be a professional trained in this field to properly analyse the DFDR data. Regardless of DOH!s pilot experience, he is not (I assume) qualified to analyse DFDRs and give an accurate conclusion. There are lots of factors of which the layman - and pilot - is unaware, and must be considered with this stuff. There are no doubt a few, highly qualified people who can look at this correctly. Flight test pilots & engineers would have - most likely - the necessary backgrounds to properly evaluate the data. I think an accelerometer will be reading zero in normal gravity. Of course, it is really in 1G, but this will be its reference. So an accelerometer will show the differential G value. There is a technical reason for this. The accelerometer has to be set to zero, somehow. The transducer types used for this are not capable of holding an initial setting indefinitely, so you would either have to take them for frequent recalibrations or you set them to zero when there is no differential force. What the reading in an FDR is, I don't know. It could have one G added, but I somehow doubt that. It wouldn't be of any use, since what we are interested in is the differential G.
So if the DFDR says +1.5G, you are pulling +1.5G but are experiencing +0.5 differential G.
So normal weight is say 100kg, so at 1.5G you would "weigh" 150kg. Last edited by Obviousman; 5th October 2006 at 03:53 AM.